LAS VEGAS—The calls for health systems to ditch fee-for-service payment in favor of value-based models were downright urgent at this year's Healthcare Financial Management Association conference in Las Vegas. "We can't afford not to make the change," David Hammer, a principal in Healthcare Performance Management Consultants' revenue cycle and managed-care practice in Fort Lauderdale, Fla., told attendees on the conference's opening day. It's been a topic of discussion at the annual conference for years. But this year, conversations seemed to indicate a breaking point. Healthcare costs are unsustainable, and anyone not on the capitation train—or at least without a ticket in their hand—is part of the problem, presenters echoed. Speakers also acknowledged the real fear C-suite leaders have about taking that leap. When margins are already squeezed, they offered, it can be hard to agree to a change that could decrease revenue further. Indeed, individual discussions with health system leaders revealed more caution than was present in thought leaders' presentations. "Honestly, there is too much fear," said Christer Johnson, health analytics advisory leader with Ernst & Young. "They're not clear on how they're going to make money. 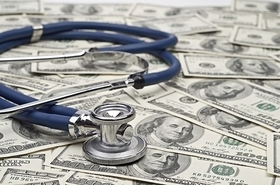 And that's why the bundled-payment programs are voluntary today." Nonetheless, the resounding theme of this year's HFMA conference: It's time to bite the bullet. In his keynote speech June 25, HFMA President Joseph Fifer urged a packed audience to forge ahead into the value-based unknown, despite a recent study by the HFMA, Leavitt Partners and McManis Consulting that found such models didn't lower the total cost of care. He attributed the finding to a lack of incentive in those programs to lower the cost of care and too little downside risk and upside opportunity. The chief financial officers of the future have a different mindset, he said. They're willing to implement payment models that truly share the risk and use metrics to assess the return on investment. "If you invest, you're part of the solution, even if your fee-for-service revenue goes down," Fifer said. "But if you don't invest, someone else will. And the revenue could still go down." A forward-thinking CFO will also formulate a value-based payment arrangement that fits within his or her specific health system and market, he said. Perhaps that's why discussions about such programs can begin to sound nebulous, like when you've seen one, you've seen one. Only a very small proportion of the hip and knee replacements performed on commercially insured patients at Providence St. Joseph Health's hospitals are paid for in bundles, or lump sums regardless of whether the total cost exceeds that amount. On the Medicare side, the Renton, Wash.-based system has seen its costs decrease significantly since it started participating in the CMS' Comprehensive Care for Joint Replacement bundles, said Kevin Fleming, Providence St. Joseph's vice president of orthopedics and sports medicine. Twenty of the system's 50 hospitals are enrolled in the joint replacement program. "Working with those government bundles really caused us to re-examine what we were doing and take a whole new approach—not being so laser-focused on what's going on within the four walls of our own hospital and looking at what we're doing for patients before they come to the hospital and then after discharge," he said. Even the system's markets that aren't enrolled in the CMS program have adopted some of those hospitals' value-based strategies, such as using case managers to make sure patients get the right care once they leave the hospital, Fleming said. Meanwhile, Toledo, Ohio-based ProMedica has value-based contracts with all major commercial insurers, said Michael Browning, the system's CFO. The contracts use per member, per month fees and share in upside opportunity, but not downside risk, he said. What bothers Browning is that even if health systems like his remove waste from the system using value-based payment, he isn't seeing the reimbursement returning to those systems. "The question would be: How are the insurance companies benefiting?" Browning said. "If you look at their stock prices, if you look at their profits, I would say value-based care has probably been pretty good for them." Similarly, the Detroit-based Henry Ford Health System, has increased the proportion of its commercial, Medicare and Medicaid contracts that are value-based and share risk from 20% in 2015 to 36% in 2017, said Robin Damschroder, the system's interim CFO. But like Browning, she questions whether health insurers will pass any resulting savings onto their members, even if Henry Ford accepts lower rates for services. "We may have lowered our cost and accepted a lower rate; the insurance company needs to be the one to get that back to the consumer," Damschroder said. "It's not in our control to give it back to the consumer." One thing that became clear at the conference, too: All this transformation is just a pipe dream if it's not backed by strong data analytics. Whereas data is commonly used today to examine single episodes of care, health systems will need to leverage data science in a scalable way and understand what's causing variability across care episodes, Ernst & Young's Johnson said. To that end, the HFMA, in partnership with Kaufman Hall, created the Financial Analytics Leadership Council, a group that will host a series of programs designed to help health systems use data, The series will take place over the second half of this year and into early 2019. Providers can aggregate data to create profiles of their patients and use those to identify the right times to call or email them to try and intervene in their behavior, Johnson said. The retail, banking and telecom industries have used machine learning and big data to influence consumer behavior for the past 10 to 15 years, he said. Healthcare hasn't quite caught on, though, and the reason is simple. "In other industries, when you influence behavior, you're influencing to make a sale, and you can directly increase your revenue and benefit," Johnson said. "In healthcare, when you do the things we're talking about today, you're reducing your revenue." Another way data can help lower the cost of care: by identifying outlier physicians with respect to their costs. At one Western health system, Johnson said he ran the numbers and found that across 20 hospitals, their joint replacement costs varied by 400%. He declined to identify the system. At Providence St. Joseph Health, Fleming's team uses data to identify which hip and knee implants are the most expensive but have the least evidence to support their benefit. They then have what can be tough conversations with the doctors who use those implants, showing them the data and urging them to choose less expensive options. "Economics just don't allow the high prices of the past, I think," Fleming said. Cedars-Sinai Medical Center in Los Angeles has a similar practice of using big data to identify low-value services being delivered at high rates to low-risk patients, Dr. Scott Weingarten, the hospital's chief clinical transformation officer, told conference attendees Tuesday. In doing so, for example, the system pinpointed one physician out of 47 peers who was accountable for 62% of the potentially inappropriate Pap smears that had been flagged. It also found a physician who had ordered six Lyme disease tests in a three-day period, despite the fact that Los Angeles County has had only one confirmed case in recent years, he said. "A lot of the things we've been working on for operational efficiency are very, very important," Weingarten said, "but we're unlikely to significantly bend the cost curve if we don't focus on physician decisions."